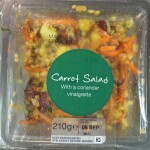 The description of this salad mentions coriander but it’s the mint (infused in sunflower oil, as M&S is wont to do) that plays a prominent role. The cinnamon in the vinaigrette is also very strong and the honey makes it quite sweet. 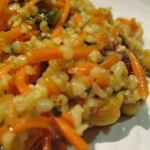 The bulgar wheat is chewy and wheat-y. The overall impression is of carrot cake, and like in a carrot cake the flavor of the carrots is pretty much lost. It’s still a nice salad, though. I had it with some brown soda bread slathered with a soft spreadable goat cheese and it made for a nice lunch. I’ve had this before and it was delicious. However, I bought a reduced version today (first reduction – 1.15pounds). I don’t know why but there was a terrible lingering taste and smell to the salad, like it had been left out a bit too long! Very disappointing – it went in the bin.